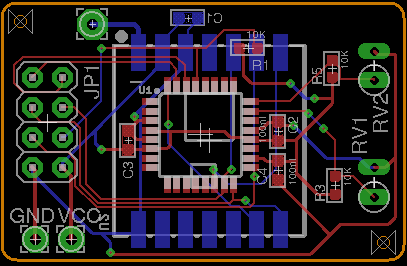 I am trying to design a PCB for a wireless Thermometer using the RFM69CW Radio Module and the ATMega328p as an MCU. I placed the MCU and the RFM69CW back-to-back on my PCB and routed all the connections, however I am unsure what to do with the antenna line. While prototyping the setup on a breadboard i simply soldered a 1/4 wavelength (865 MHz) monopole wire antenna to the antenna pad of the RFM69CW modules and everything worked fine. However now I read a lot about RF Design and I am completely unsure what I should or shouldn't do. I originally intended to simply route a standard trace from the ANT pad of the module to a plated trough hole and then solder my wire antenna to the hole. However, I read in several places, that i have to match the impedance of the trace to 50 Ohm and that i also have to put a ground plane next to or under(?) the trace. What is the best way to add a simple wire antenna to my PCB design? I already saw designs like the Aaduino or the Moteino from LowPowerLabs that just connected a plated trough hole some millimeters away from the ANT pad of the RFM69CW and put a ground plane on the other side of the PCB. Is it that simple or are there certain calculations behind these designs? Attached is my design, the trough hole on the top left is my current attempt for mounting the wire antenna. The four extra wires run parallel with ground (usually) and, through a mixture of being the right length and their capacitance to real ground give a decent result. Those wires connect to the outer on the coax. But, if your monopole is close to the PCB it will work reasonable. After all a walkie talkie only uses a monopole and relies on "person" capacitance to ground to make it effective. However, if you don't have a ground plane on your PCB you will need one. Antennas don't necessarily need a ground plane to produce a radio wave - Voyager 1 and 2 managed quite nicely without one because their antenna doesn't rely on a ground plane. Neither does a dipole antenna but that needs a balanced drive. Just try it and see is my advice but do use a GP on your PCB for this and EMC reasons. Not the answer you're looking for? Browse other questions tagged pcb rf antenna or ask your own question. How do components on a ground plane of monopole pcb antenna effect radiation/efficiency? Is a matching network needed if the antenna feed line is very short?